The Popes words emphasise St. Joseph the Patriarchs main vocational identity. It would be wrong to consider Marys husband as a marginal presence in Christs educational growth. Joseph is called - together with the Mother of God  to look after and raise the Son of God, through a very personal act of obedience. It is Joseph who helps us understand to what lengths God will go to ask his creations to surrender themselves completely to His will. The task Joseph is called to fulfil, is that of making space for God, because it is through his personal authorisation that the mystery of salvation can be accomplished through the incarnation of Christ. 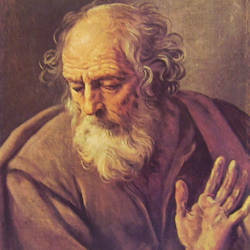 St. Josephs fertility is essentially his willingness to give himself up and to embrace Gods will, in its entirety. Another great Pope  renowned for his personal devotion to Mary - also bears St. Josephs name: the Blessed John Paul II. .and received the same love, through whose power the Eternal Father has predestined us to be His adopted children through Jesus Christ. (Redemptoris Custos, 1: 17-18). May the Discalced Carmelites, faithful custodians of the church of Wadowice, in accepting my gratitude for all that I received from the Carmelitan school of spirituality during my childhood, following the example of their Holy Mother Teresa of Jesus, contemplate in St. Joseph, the perfect model of the intimacy with Jesus and Mary, Patron of inner prayer and of tireless service to ones brothers (see Vita, 6: 6-8 ; 32, 12). Three recent Popes with the name Joseph! Wow! This is a Catholic Caucus thread. Please follow the Guidelines of the Religion Moderator when posting on this thread. I hope that’s a typo that has a monseigneur with a granddaughter. Grand niece? God daughter? good sermon about st. joseph at the EWTN mass tonight. Could be as you say. I don’t think we had the married priests that we have today who came from other religions converting to Catholicism. I understand that the Italian community celebrates St. Josephs Day like the Irish honor St. Patrick.